We crunch a lot of numbers at Rocket Referrals. When our developers aren’t coding, fixing bugs, or growing out their neck-beards (just kidding), they’re often digging into user-data; looking at things like which email templates are performing the best or how users are interacting with new features. And, on occasion, I’ll ask them to run some numbers for me, as well. As it so happens, earlier this month was one of these occasions. The Net Promoter Score (NPS) is an important component of our software, so I wanted to see if there was a correlation between how a client responded to the NPS, and the lifetime value they bring an insurance agency. For those of you new to the NPS, it’s a single-question inquiry using a 0-10 scale to gauge the amount of loyalty a client has towards a company. Respondents are grouped into three categories: Promoters (9-10), Passives (7-8) and Detractors (0-6). Of these three, it’s widely thought that promoters are particularly valuable for a business, because they’re willing to refer or recommend them to friends and family. But until now, within the insurance industry, this belief was based on pure speculation or intuition rather than raw numbers. This is because NPS scores and referral data are seldom collected, much less compared. I can say for certain that until we collected this data at Rocket Referrals, it never existed across insurance agencies. After analyzing data from hundreds of insurance agencies, and hours spent at the whiteboard, we determined that a promoter can be worth an average of 7x that of a non-promoter. Our research shows that when you account for their referrals, in the first 18 months alone, promoters are worth an average of 112% more than a typical insurance client. In 10 years’ time this number climbs to 155%. Here’s where it gets interesting: when you factor in the additional referrals made by the new clients that are won due to their recommendations, the value of a promoter reaches 700% of that of other clients over the course of a decade. But there’s a catch! Not all promoters are worth this much. Promoters are full of potential. However, if they’re not properly motivated most will remain idle and, aside from being easily retained, won’t bring more value than your every-day clients. It’s important to point out that although promoters indicate a willingness to refer their insurance agency there’s no guarantee that they’ll act on this feeling. This is especially true in the insurance industry where the products and services offered aren’t particularly exciting. Although a fantastic experience with an insurance agency will certainly delight a client, people still aren’t overly eager to talk with others about it. Rather, promoters in this industry are largely opportunistic; acting as vocal promoters in situations that call for it. 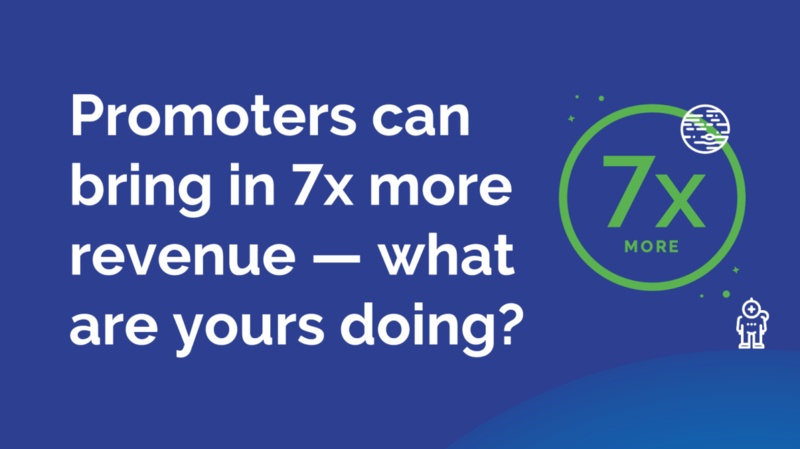 In fact, 77% of your clients are willing to refer you. It’s the job of the insurance agent to take full advantage of these opportunities. This includes using highly targeted communication that gives reason to already-willing clients to actively share their experience with friends and family. It also means finding new ways for clients to refer and making it very easy for promoters to do so. Not long ago, the terms ‘referral’ and ‘personal recommendation’ were to be used interchangeably when referencing how someone went about promoting their insurance agent to others. But over past decade the way people communicate has evolved and a referral can now take several different forms. The most significant of which for an insurance agent is a testimonial, online review, or personal recommendation. Each one contributes in its own way; ultimately providing credibility and visibility to an insurance agency. Whereas before consumers had access only to a small network of friends and family to lean on for recommendations – today people have instant access to hundreds of public reviews and testimonials. At the same time, personal recommendations are still a very powerful way of getting your foot in the door with new prospects. If an agent wants to realize the full 7x value of their promoters, they need to have a strategy of collecting referrals in their various forms.